Performing string quartets by Joseph Haydn, Sergei Prokofiev, and Caroline Shaw. What is Trinity Alps Chamber Music Festival? 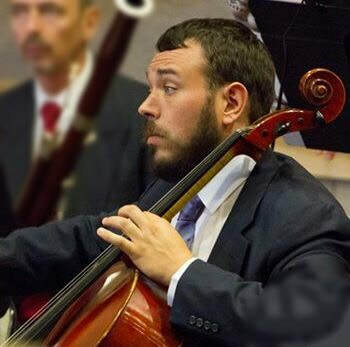 The Trinity Alps Chamber Music Festival presents concerts of classical chamber music to communities across Northern California. Featuring an annual summer retreat and festival in the beautiful Trinity Alps of Northern California, as well as seasonal tours in the fall, winter, and spring, this organization has to date presented over 100 free public concerts across Northern California, and visited dozens of schools for educational outreach performances. Who is Trinity Alps Chamber Music Festival? Founded in 2011 by Ian Scarfe, this organization boasts a rotating cast of some of the best professional classical musicians in the world. Many of the more than 50 affiliated musicians are based in the San Francisco Bay-Area, while the rest hail from across the United States, Canada and Europe. 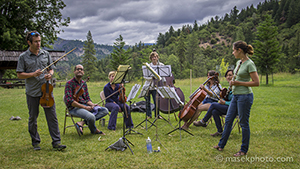 Where is Trinity Alps Chamber Music Festival? 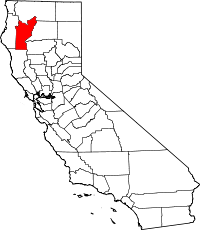 Centered in Trinity County in northwestern California, this organization presents concerts and events in a geographic area reaching from Eureka on the western coast, eastwards to Redding, north to Yreka and the Oregon border, and as far south as the San Francisco Bay-Area. "Trinity County is rugged, mountainous, heavily forested, and lies along Trinity River. The county has no traffic lights, no freeways, no parking meters, and no incorporated cities. Weaverville, the county seat, has the distinction of housing some of California's oldest buildings. The courthouse, built in 1856, is the second oldest in the state, and the Weaverville Drug Store has been filling prescriptions since 1852. The Joss House is an historic Taoist temple built in 1873." 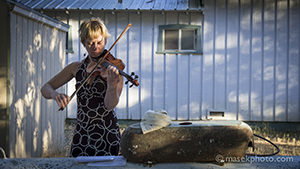 The festival holds an annual retreat in the small and remote community of Hyampom, at the farm of co-founder and violinist Ellen McGehee, and has presented concerts and visited schools in Weaverville, Eureka, Redding, Yreka, Junction City, Douglas City, Lewiston, Coffee Creek, Willow Creek, Hayfork, Red Bluff, Sonoma, Napa, San Rafael, Mill Valley, San Francisco. Thanks to our Season Donors!